Not to be confused with Black Irish. Black people have lived in Ireland in small numbers since the mid-16th century. They include the rebel Mulatto Jack (fl. 1736), the singer Rachael Baptist (fl. 1750-1775), who were both Irish. Other such as Osmond Tisani (fl. 1905–1914) were born abroad but settled in Ireland. Mainly concentrated in the major cities and towns, especially the N7 Corridor, Limerick, Cork and Dublin, many in the 18th century were servants of wealthy families. Former slaves who visited or toured Ireland included Olaudah Equiano  and Frederick Douglass. Lord Edward FitzGerald was saved in 1781 by Tony Small, a freed slave, after the Battle of Eutaw Springs. Small returned with Lord FitzGerald to Ireland, and in 1786 his portrait was painted by John Roberts. 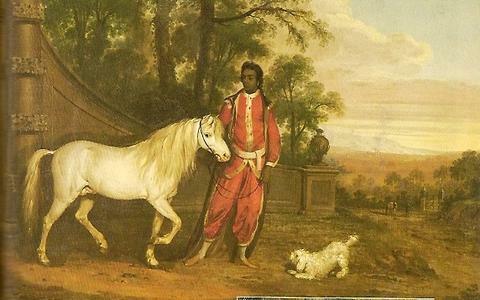 Black slavery was rare in Ireland at this date, although the legal position remained unclear until a judgement in England in 1772, the Somersett's Case. Others were tradesmen, soldiers, travelling artists or musicians. Never very numerous, most of them were assimilated into the larger population by the second third of the 19th century. The increase of Ireland's non-white population started with the Irish boom of 1997 to 2009 is due in part to the laws which had governed Irish citizenship since the creation of the Republic of Ireland in 1937. These laws, which granted citizenship jus soli, were, for a period, interpreted by the Department of Justice as allowing parents who were not Irish citizens to remain in the state based on the rights of their Irish-born citizen children. This automatic granting of residency ceased in 2007, following a decision of the Supreme Court. The Twenty-seventh Amendment of the Constitution of Ireland changed the qualifications for Irish citizenship in 2004. The 2006 Irish census recorded 40,525 people of Black African ethnicity and 3,793 people of any other Black background resident in the Republic of Ireland out of a total population of 4,172,013, meaning that 1.06 per cent of the population self-identified as Black. The preliminary results of the 2011 census recorded 58,697 people of Black African ethnicity and 6,381 people of any other Black background resident in the Republic of Ireland out of a total population of 4,525,281, meaning that 1.42 per cent of the population self-identified as Black. In 2007, Nigerian refugee and politician Rotimi Adebari was elected as mayor of Portlaoise, the first black mayor in Ireland. In 2011, Darren Scully resigned as mayor of Naas after stating he would refuse to represent "black Africans" because of their "aggressiveness and bad manners". The Celtic Tiger boom of 1992–2007 also increased immigration into Ireland from all parts of the world, including Africa, and this led to delays in processing applications at the Garda National Immigration Bureau. For non-EU persons this led on to restrictive laws and hundreds of deportations annually of those not qualifying for asylum or admission. Some failed asylum cases received considerable media attention, such as that of Pamela Izevbekhai, who claimed that her daughters were likely to be subjected to female genital mutilation following deportation, and that another daughter had died from the same procedure in 1994. Despite presenting her case to the Seanad in 2008 and as far as the Supreme Court of Ireland and European Court of Human Rights, the court found in 2011 that her use of forged documents was "inadequate". At the time of the 2001 UK Census, of the total population (1,685,267); 255 people described their ethnicity as Black Caribbean, 494 as Black African and 387 as Other Black, meaning that the total Black population was 1,136. These figures do not include individuals who described themselves as being of mixed-race. The next UK census is to be performed in 2011. As well as help from the Equality Commission for Northern Ireland, the EU-funded Afro-Community Support Organisation Northern Ireland (ACSONI) was formed in 2003 to represent the views of black people. ACSONI prepared a report in 2011 on other residents' perceptions and general knowledge of Africa and Africans. ↑ Walvin, James (1998). An African's Life: The Life and Times of Olaudah Equiano, 1745–1797. Continuum International Publishing Group. p. 165. ISBN 9781441120304. ↑ "Parents of an Irish Child" (PDF). Immigrant Council of Ireland. 2009. Archived from the original (PDF) on 12 June 2009. Retrieved 11 July 2010. ↑ "This is Ireland – Highlights from Census 2011, Part 1" (PDF). Dublin: Stationery Office. July 2007. p. 11. Retrieved 4 July 2007. ↑ This is Ireland – Highlights from Census 2011, Part 1 (pdf). Stationery Office, Dublin, Ireland. 2012. p. 37. ISBN 978-1-4064-2650-2. Retrieved 12 July 2012. ↑ "Darren Scully resigns as Mayor of Naas". RTÉ.ie. 22 November 2011. Retrieved 22 November 2011. ↑ "Table KS06: Ethnic group (numbers)". Northern Ireland Statistics and Research Agency. Retrieved 4 January 2011. ↑ ACSONI report online, May 2011; seen on 24-11-2011 Archived 27 October 2011 at the Wayback Machine.